As a multi-container application, FME Server supports deployment with Docker Compose. We recommend deploying FME Server this way only if you have worked with Docker before and understand its architecture. The Compose file defines containers for each of the services that comprise FME Server. These service names can be specified to start, stop, scale, or run other commands on a specific container. They are also used as the host names for the containers to communicate with each other. nginx Reverse proxy for FME Server; receives all web traffic and forwards it to the right container. Also responsible for handling the https connection. fmeservercore maps port 25 for SMTP relay. Once FME Server is deployed, any requests to these ports on the host machine are routed to the proper container. This means you can access the FME Server Web User Interface on port 443 of your host machine even though the fmeserverweb service is actually running inside a container. 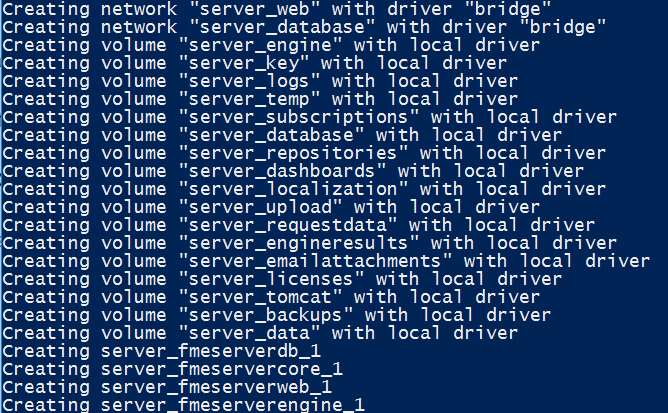 Database - Where the fmeserverdb service stores its database files. FME Server System Share - Actually comprised of several volumes that restrict access to certain folders from containers that do not require it. Docker containers are versioned using tags, which are specified after the image name with a colon. For example, safesoftware/fmeserver-engine:2018.1.1-20181120 has image name safesoftware/fmeserver-engine and tag 2018.1.1-20181120. A tag for each official major release. For example, 2017.0, 2017.1, and 2017.1.1. A tag for the number of a specific build that is made public. For example, 18505. If a hotfix is applied to a particular release or build, the tag is updated with a date. For example, 2018.1.1-20181120. We recommend downloading the file that is tagged with the latest date of the version you want. Docker Compose files and Kubernetes quick start scripts are available at http://fme.ly/container-deployments for each available tag of the FME Server container deployment. Use the docker-compose command to create, start, and stop FME Server. This command looks in the current directory for a file named docker-compose.yaml, and uses that for the definition of what to deploy. Alternatively, you can pass in a path to a compose file using the -f parameter. Example commands below assume that a docker-compose.yaml exists in the current working directory. Use the up parameter to bring up a new set of containers as defined in docker-compose.yaml. Pass in the -d parameter to run in the background. Docker Compose creates the networks, volumes and containers defined in the Compose file. When complete, you can connect to the FME Server Web User Interface on https://localhost/. The administrator user name and password defaults to admin and admin, respectively. You can change this on the Users page. The down command destroys all containers, volumes and networks that were created in the stack. The -v parameter removes the volumes as well. Without the -v parameter, the Database and FME Server System Share volumes are not destroyed, and if the same stack were launched again using up, no data would be lost. Make a local backup of FME Server on the Backup & Restore page of the Web User Interface. Make sure this file is saved somewhere outside of the FME Server Resources folders, as those will be removed. Remove the containers, volumes and networks. Download the latest version of the containers. Deploy the new version of the containers. Restore your backup on the Backup & Restore page of the Web User Interface by uploading the backup file you saved in step 1. While not recommended for production machines, running multiple FME Server stacks on a single machine may be useful if you are prototyping or testing workflows on multiple versions of FME Server. This sets the external port on all relevant containers to 8080 and brings up FME Server. Remove the exposed port 80 from the nginx container in the Docker Compose file (line 80:8080). WARNING: Ensure a copy of the certificate is stored in a different location before mounting it in the nginx container. The code in the container may have untested "edge" cases that overwrite the certificate. nginx.crt: The certificate, including full certificate chain, if necessary. nginx.key: Private key used to generate the certificate. Once provided, pass in the location to the certificate and key by setting the SSLCERTLOCATION=/path/to/certificates variable.